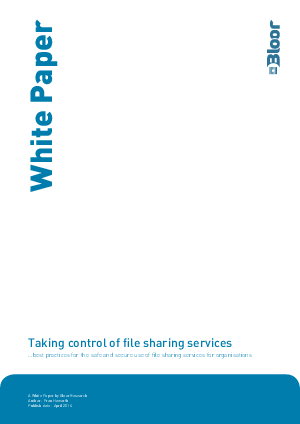 This document aims to provide best practice guidance for organisations regarding the safe and secure use of file sharing and storage services. Such services are already in common use among consumers and within organisations, albeit in a patchy fashion or through the use of unsanctioned services. To provide the level of data protection that is required of organisations and in order for them to benefit from the opportunities that such services offer in terms of reduced cost, added convenience and improved productivity, all organisations should take a close look at what is already happening within their walls and look to implement a service that caters to all file sharing needs across the organisation in a holistic manner.